Venezuela Expels U.S. Diplomat For Attempts To 'Destabilize The Country' : The Two-Way Venezuela's vice president also hinted that the United States was behind President Hugo Chávez's cancer. He said that despite its ailing leader, the revolution is "ready to act in coordination" against attempts to destabilize the country. Venezuelan Vice-President Nicolas Maduro in February. During a long, fiery speech, Venezuelan Vice President Nicolás Maduro said the country had expelled American diplomat David del Monaco because of what Maduro said was his work trying to "destabilize the country." 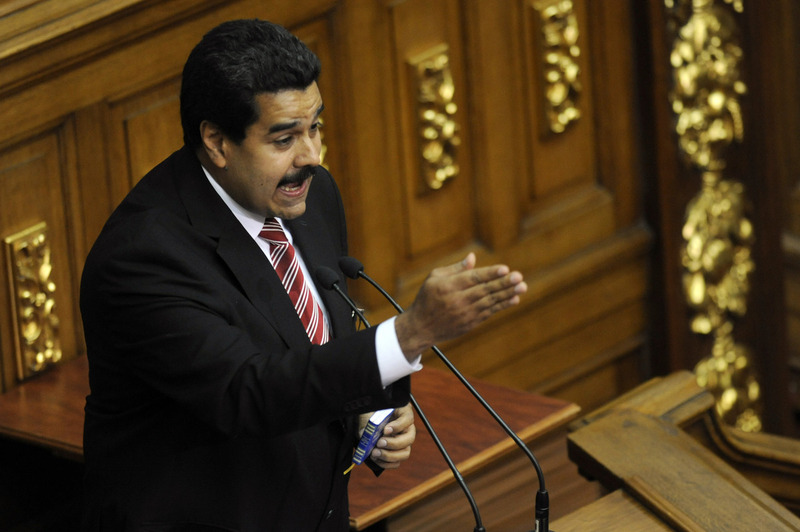 "Mr. David del Monaco has 24 hours to pick up his bags and leave the country," Maduro said in the televised speech. Maduro expanded little on the health of President Hugo Chávez, but he left little doubt that his condition was grave. He said that Chávez was living the most "difficult hours" since he went to Cuba for an operation in December. Maduro also repeated an accusation that Chávez himself made in 2011: That the United States was behind Chávez's cancer. He wondered, if like Palestinian leader Yasser Arafat, Chávez had been poisoned. Maduro seemed to setting the table for a Venezuela without Chávez. He talked about the ailing leader's legacy and said he was their "teacher, our father and our supreme leader." "The people consider him the new liberator," he said. "That's what Chávez means to us and to our history." But, as Chávez fights for his life, he said the country must march on. The government will continue its functions and Venezuelans must pray but at the same time, he said, be ready to defend the country's constitution. Maduro looked straight at the camera and issued a warning: Despite its ailing leader, the revolution, he said, is "stronger than ever" and "ready to act in coordination" against any attempts to destabilize the country. Maduro also minced no words when he tied the country's "right" with the United States, which, like Chávez, he termed "the imperialists." Toward the end of the speech, he warned "traitors" that their day would come sooner or later. "A State Department spokesman responded by wishing Chavez the best in his fight with cancer," NPR's Juan Forero tells our Newscast unit.